MobileHorizons gives you results and data extracted from inside previously walled off 3rd-party Mobile Search Apps, and is designed from the ground up specifically for Semantic Search. What goes into a MobileHorizons Project? Type of Device: Specify your projects to run on any of: Generic Android smartphone, Generic Android Tablet, iPhone 6, iPad Air. In future releases, you will be able to specify specific Android devices and screen sizes. Apps: Search on a growing number of native Mobile Apps, eg Google Maps, Apple Maps, Yelp and Foursquare. 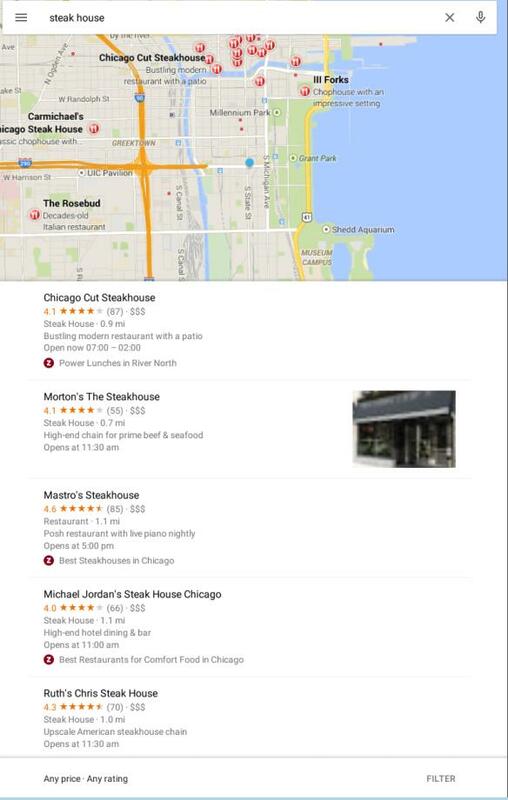 Soon we’ll have other search apps like OpenTable, YP and several Travel industry apps. User Intent + Post-Hummingbird Modelling: Today’s Post-Hummingbird Search Engines endeavor to understand “User Intent” to return more relevant results. They do this by building up a “Composite Query” from any “explicit query” the user physically enters, combined with implicit signals (like your device, location). Instead of tracking keywords for websites, MobileHorizons enables you to track results for “Composite Queries” (Explicit + Implicit signals) for your website or business. Entities: Unlike web-based search engines, Apps like Google Maps and Apple Maps are “local” and do not show results for just websites. They can list all types of businesses, organizations and points of interest, that in the Post-Hummingbird world, are referred to as “Entities”. MobileHorizons focuses on building up your data and intelligence about the Entities you and your clients want to track. Precise Location: In traditional web-based keyword ranking, search engines attempted to personalize results based on an approximation of your location. Native mobile apps need to know your precise location, because it is a very important part of the implicit query. MobileHorizons enables you to track results for multiple pinpoint locations, so you can model the exact behavior of a Mobile app user and their search results. By entering a few specific locations within the same neighborhood, you can “triangulate” a local SEO campaign to identify local strengths and weaknesses of your clients’ Entities and their competitors. Actionable Data: All of our Projects use Implicit Query signals such as Device, App and Location, along with Explicit Queries to model User Intent. Not only will you get actionable downloadable data, but you will also get ARPs (App Result Page) to see how your entities visually match up against the competition.